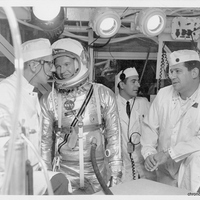 Photographed on the left is Günter F. Wendt, who was in charge with launch pad preparations, with astronaut Gordon Cooper (1927-2004), photographed in a space suit, at the Cape Canaveral Air Force Station Launch Complex 14 (LC-14). It is not known if this photograph was taken on launch day or for a practice day. Cooper successfully launched and completed his mission. Original black and white photographic print, May 1963: Private Collection of Dr. Calvin D. Fowler. Digital reproduction of original black and white photographic print, May 1963. 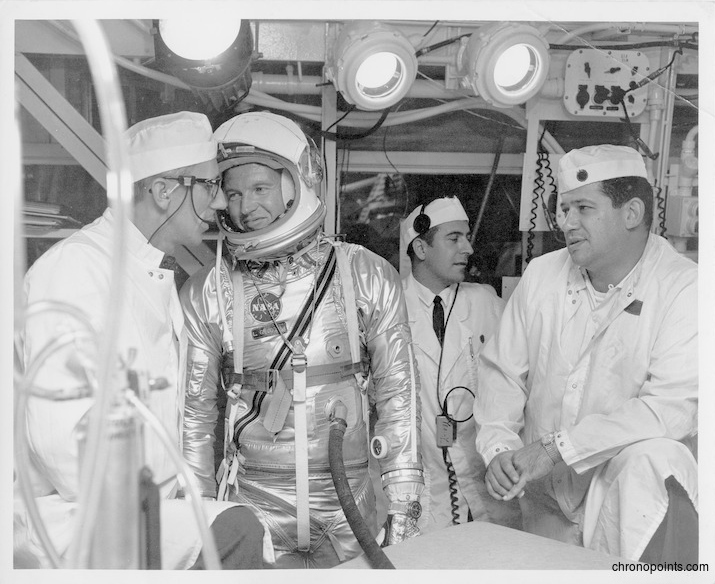 “Günter F. Wendt and Astronaut Gordon Cooper at Cape Canaveral Air Force Station Launch Complex 14.” RICHES of Central Florida accessed April 25, 2019, https://richesmi.cah.ucf.edu/omeka/items/show/5021.